Glass is a treasure of unparalleled depth of color, reflectivity, and texture – a rich medium that lends itself naturally to experimentation. My fused and slumped glass collection fully explores these qualities to create pieces that are multi-dimensional, yet unique in character and form. Combining elements of logic, science and chance, each piece boasts an elegance that is as distinct as it is timeless. Color: Eggplant with dark stripe. 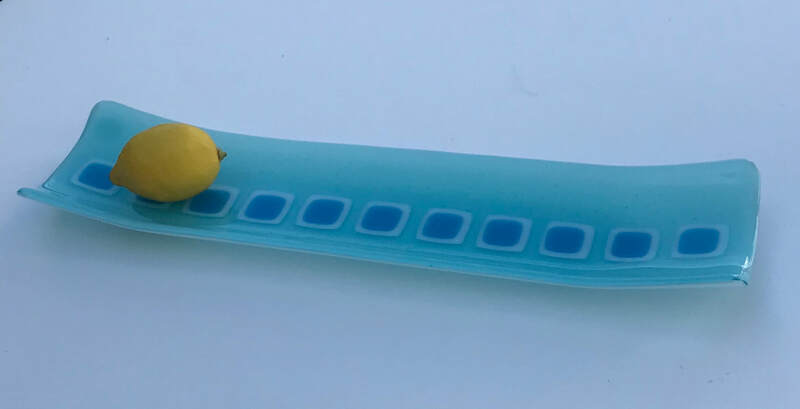 PL5 "Ripple" Clear and aqua filigree platter measuring a full 15"x15". Notice the reflective pattern on the surface below. 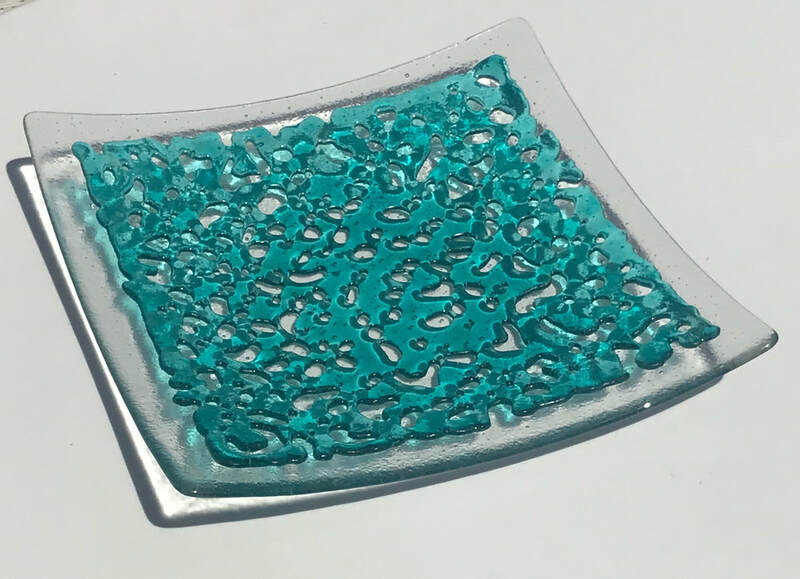 Color: Clear glass with turquoise filigree raised ripple pattern. Color: Clear iridescent glass with aqua marine dots. Contrasting details in copper colored glass. PL13 "Rain Drops". 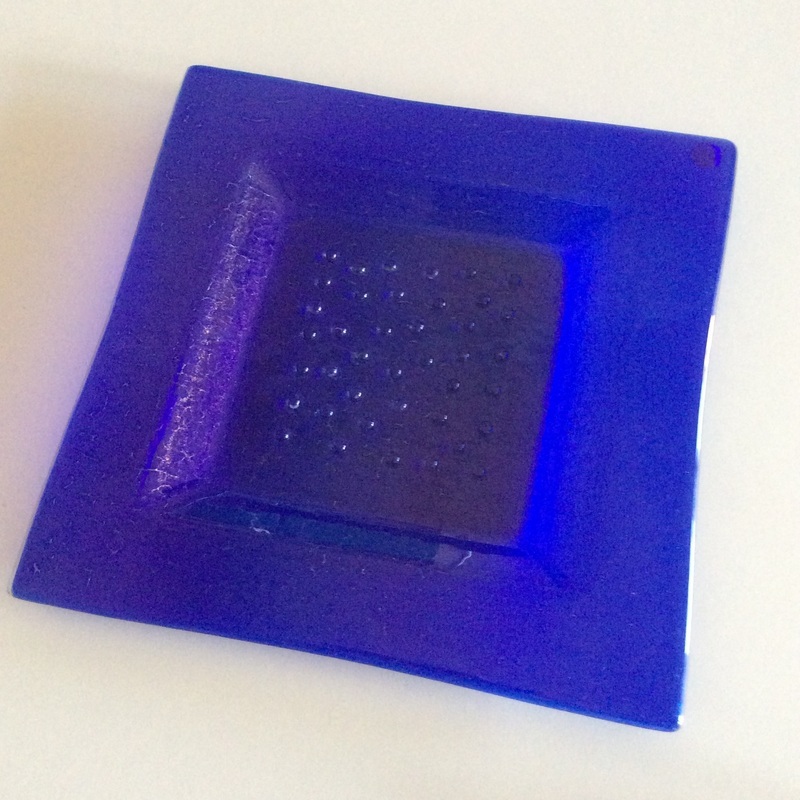 Large iridescent royal blue platter with clear "rain drops" in bottom of platter. Stunning in its simplicity. I make this piece one at the time, so variations may be expected from one piece to the next. Color: Iridescent royal blue glass w. clear "rain drops"
PL15 "Organics". 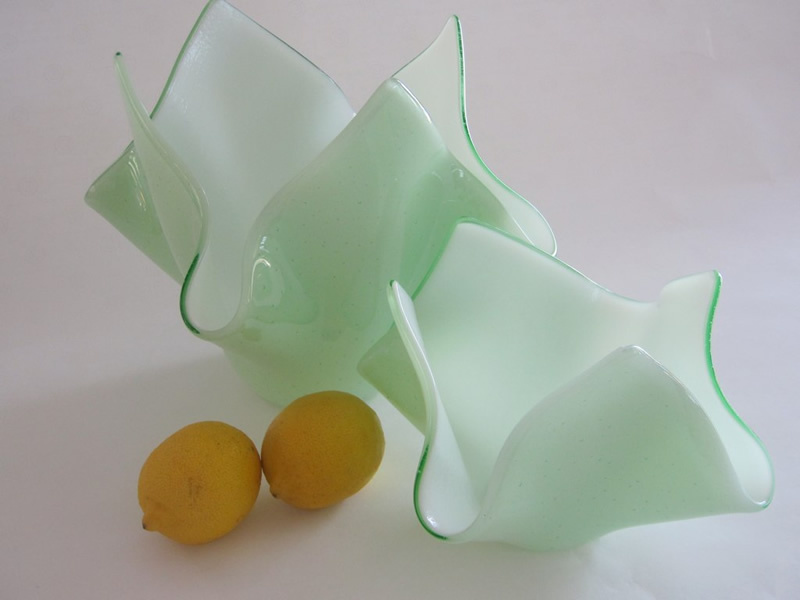 Made from aqua colored glass with inlays of clear and "organic" multicolored stripes. I make this piece one at the time, so variations may be expected from one piece to the next. 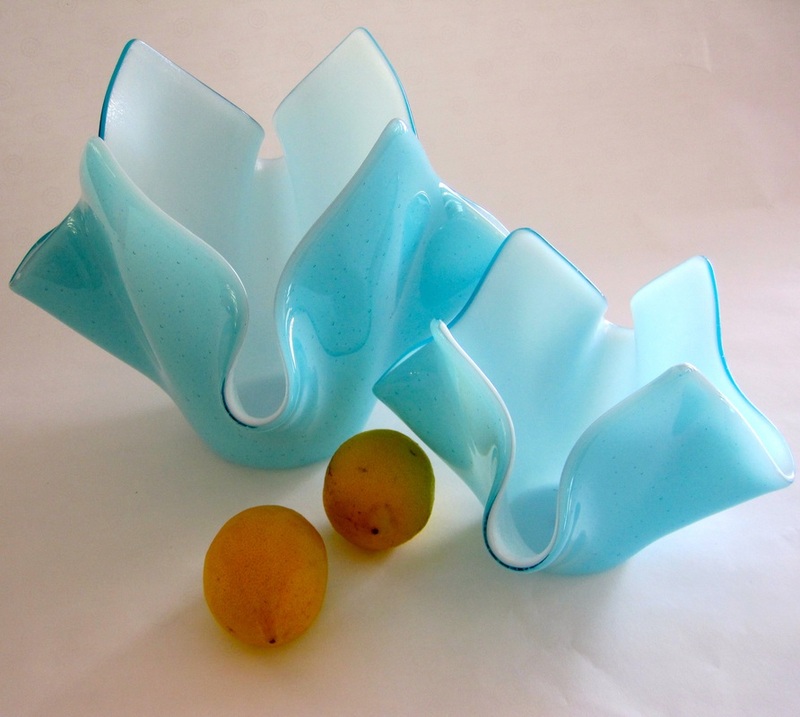 Color: Aqua glass with "organic" inlay. 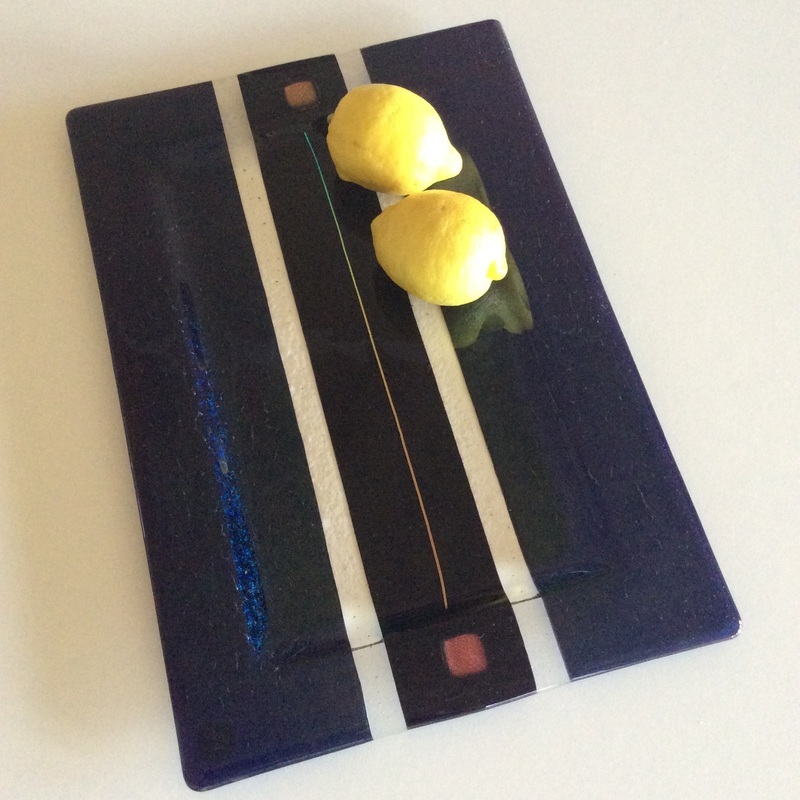 PL17 Handmade of fused glass, this special platter is as useful as it is decorative. Made of ruby red and clear glass. I make this piece one at the time, so slight variations may be expected from one piece to the next. PL21 "Square on Squares". Fused and slumped platter in Light Aqua with White and Aqua accents. PL2 "Organics" Fused & Slumped Platter in Turquise This turquise fused and slumped platter has a multicolored inlay. 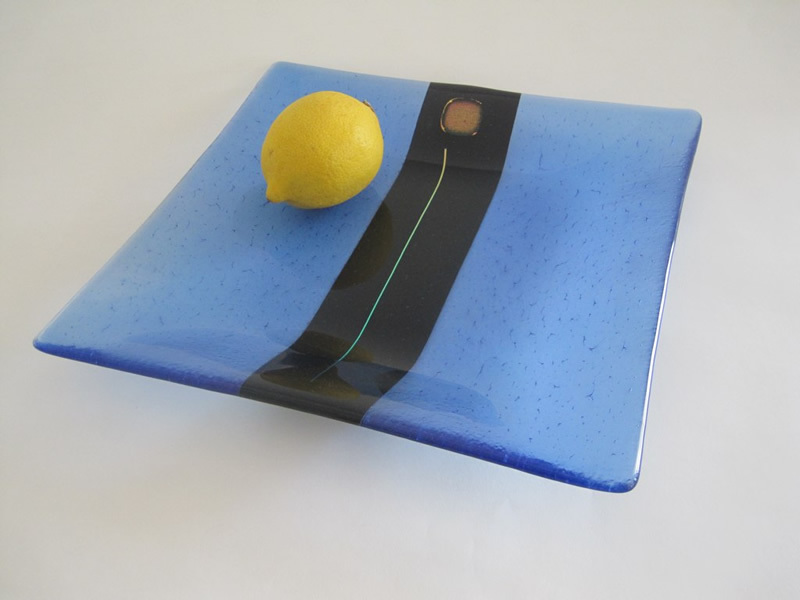 Handmade of fused glass, this special platter is as useful as it is decorative. I make this piece one at the time, so slight variations may be expected from one piece to the next. Color: Turquise with multicolored stripe. 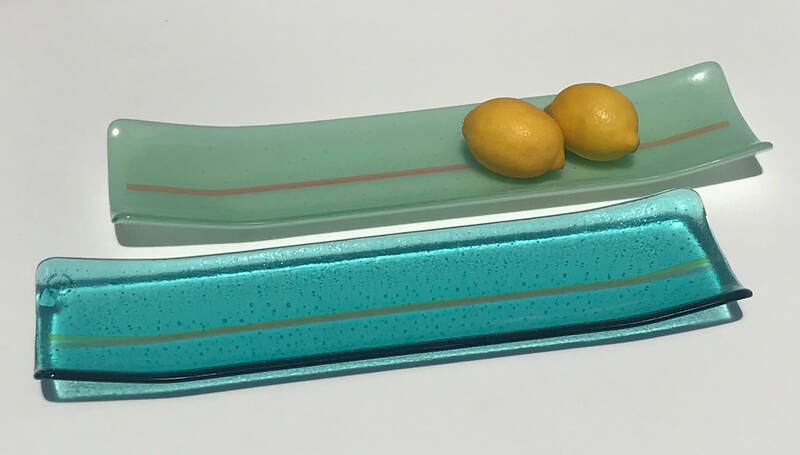 PL6 "Vanilla Aqua" large platter measures 18" x 18" x 2"h. The stunning play of vanilla, dark green and clear aqua colors makes it as suitable for use as a platter as being displayed vertically on a stand.I make this piece one at the time, so variations may be expected from one piece to the next. 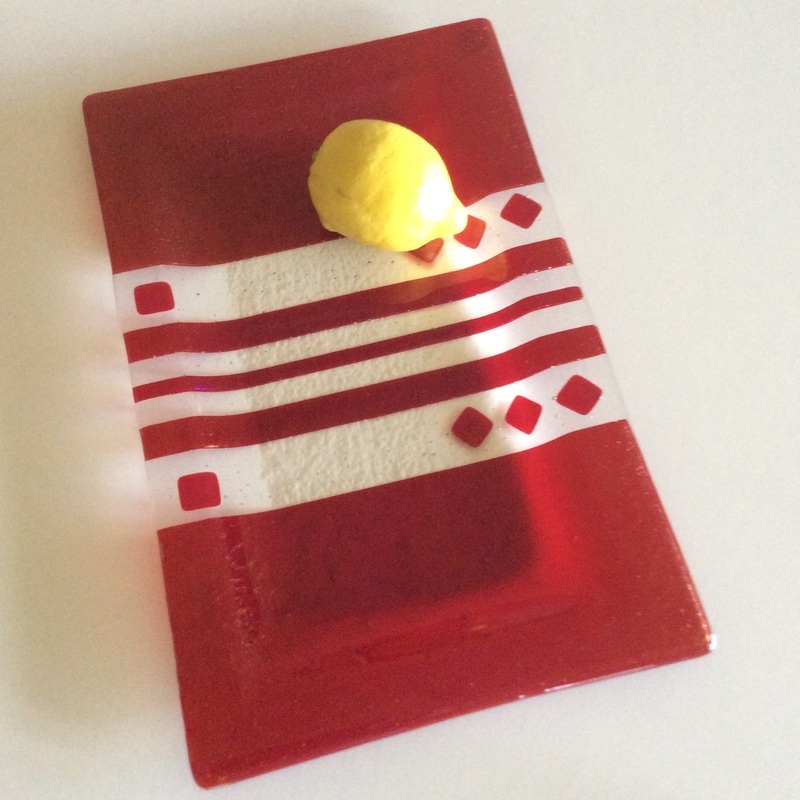 PL8 Handmade of fused glass, this special platter is as useful as it is decorative. Made of dark purple and clear iridescent glass with contrasting inlays I make this piece one at the time, so slight variations may be expected from one piece to the next. Color: Dark purple and clear iridescent glass with contrasting inlays. 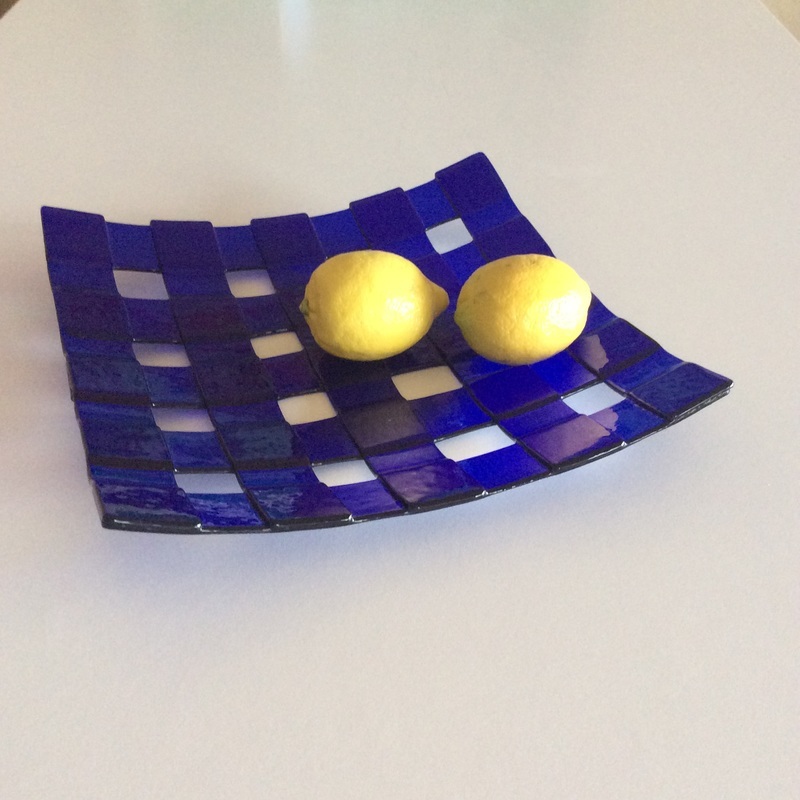 PL10 Fused & Slumped Platter in Royal Blue glass. Great to use for fruit or anywhere outdoors since it does not collect water. 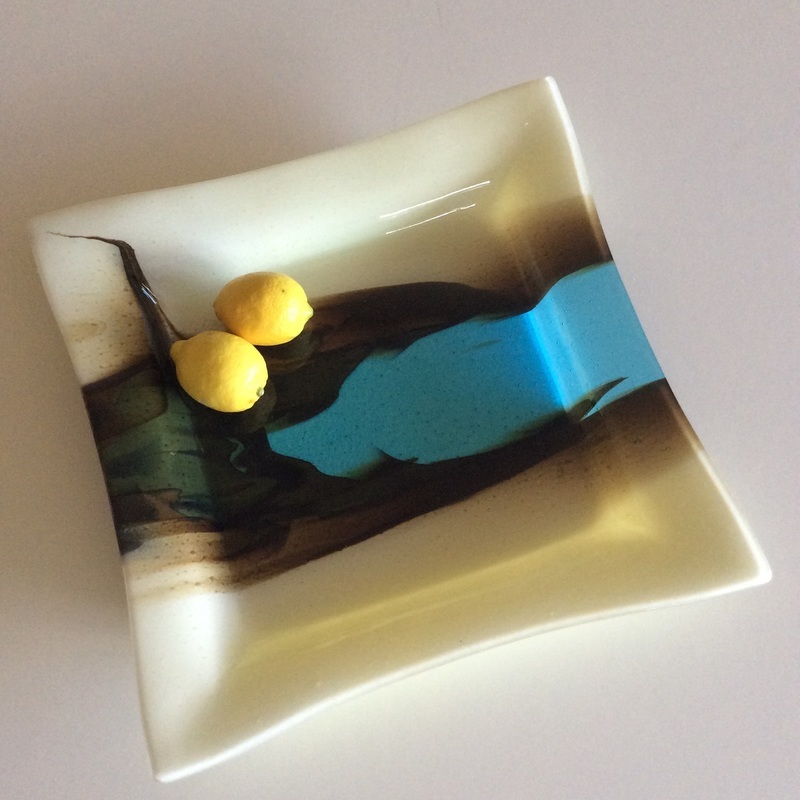 Handmade of fused glass, this platter is available in a number of different colors. I make this piece one at the time, so slight variations may be expected from one piece to the next. 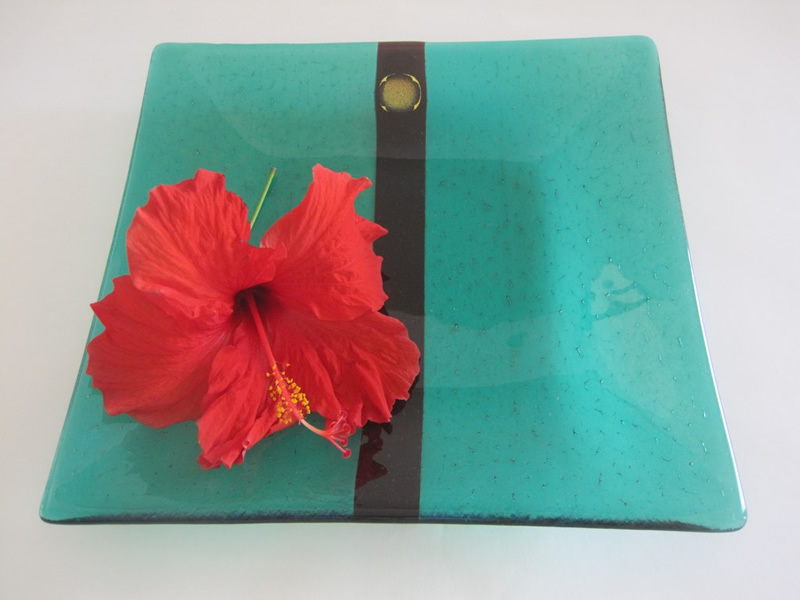 PL12 "Curve" Iridescent platter in light aqua marine glass with enhanced synchronized details. PL16 "Cosmos" Fused & Slumped Platter in dark iridescent and sky blue glass, accented with touches of Dichroic. Quite sophisticated. I make this piece one at the time, so slight variations may be expected from one piece to the next. 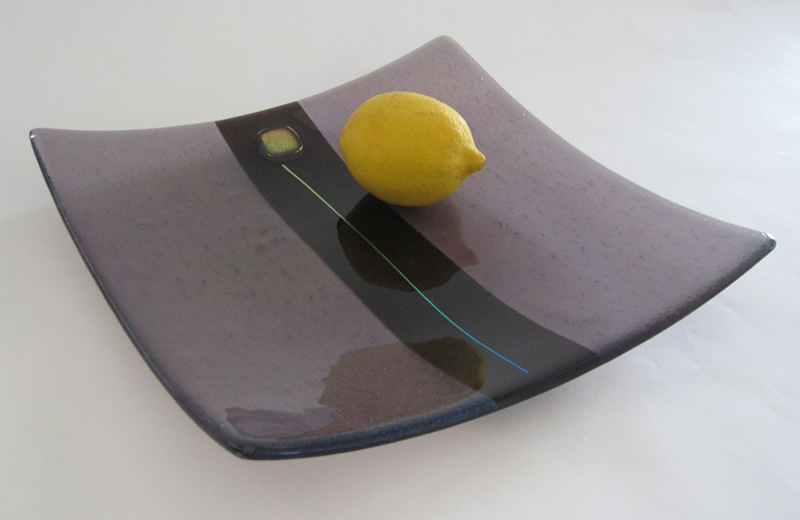 PL18 "Squares" Handmade of fused glass, this special platter in dark green, shades of plum on a clear background. It is as useful as it is decorative. I make this piece one at the time, so slight variations may be expected from one piece to the next. 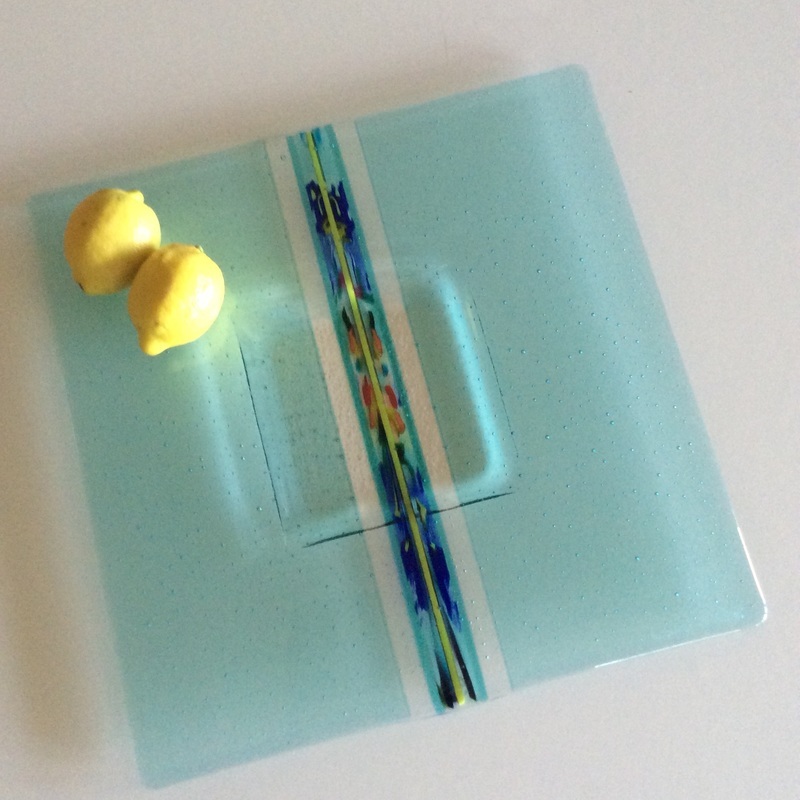 PL22 "Straight and Narrow" Fused and slumped narrow platter with inlay of Dichroic. Perfect for serving snacks. Approximate size: 4 3/4" x 17"
PL23 "Straight and Narrow" Fused and slumped narrow platter with inlay of Dichroic. Perfect for serving snacks. PL24 "Straight and Narrow" Fused and slumped narrow platter with inlay of Dichroic. Perfect for serving snacks. PL27 "Straight and Narrow" Fused and slumped narrow platter. Perfect for serving snacks. 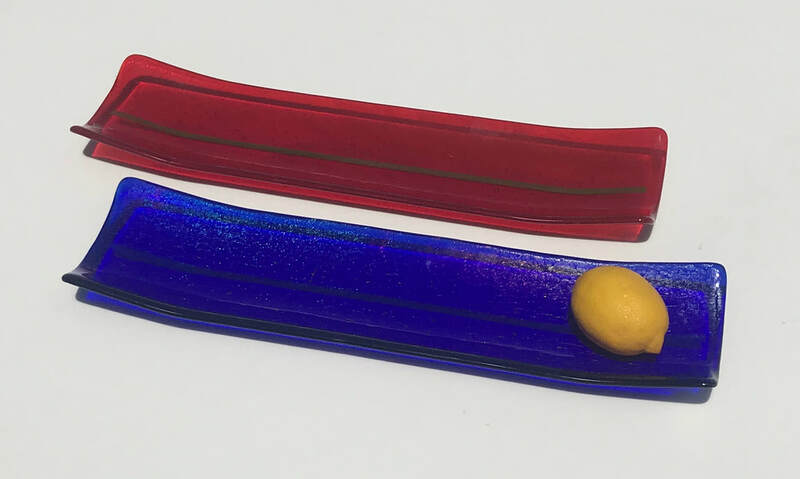 PL26 "Straight and Narrow" Fused and slumped narrow platter with inlay of Dichroic. Perfect for serving snacks. B13 "MOTHER/DAUGHTER" vessels in white and turquoise glass, fused and slumped. These vessels are made over a 48 hour period and may vary slightly from one piece to the next. Turquoise on the outside - white on the inside. B11 Handkerchief bowl inspired by Guatemalan fabric design, this bowl is made from multicolored threads of glass, fused and draped to form an elegant art piece with all four sides simulating fringes of the fabric. I make these bowls over a 48 hour period and slight variations may be expected from one piece to the next. 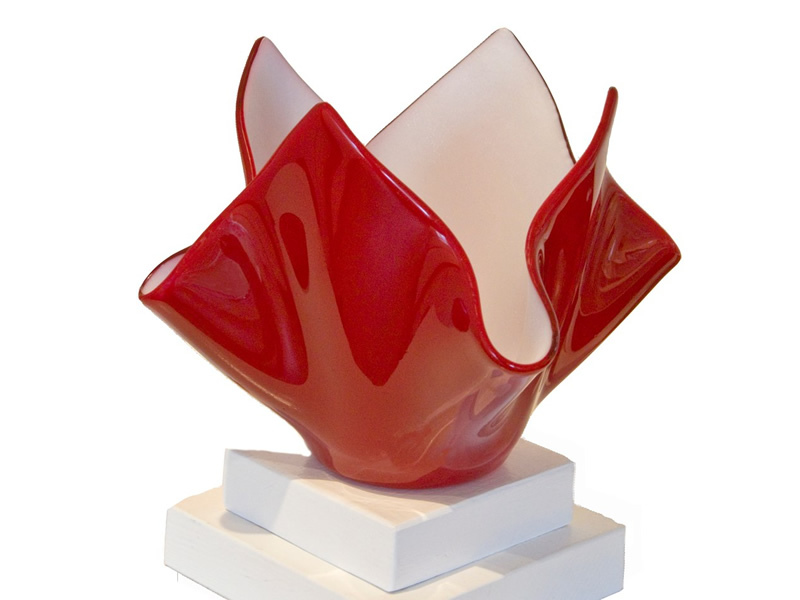 B15 "Ripple" sculptured vessel with an elegant swirl of orange red ripples on the inside. Ripples are slightly raised giving a soft three dimensional feel. SPECIAL FEATURES Color: Clear glass with a orange red raised ripple pattern. 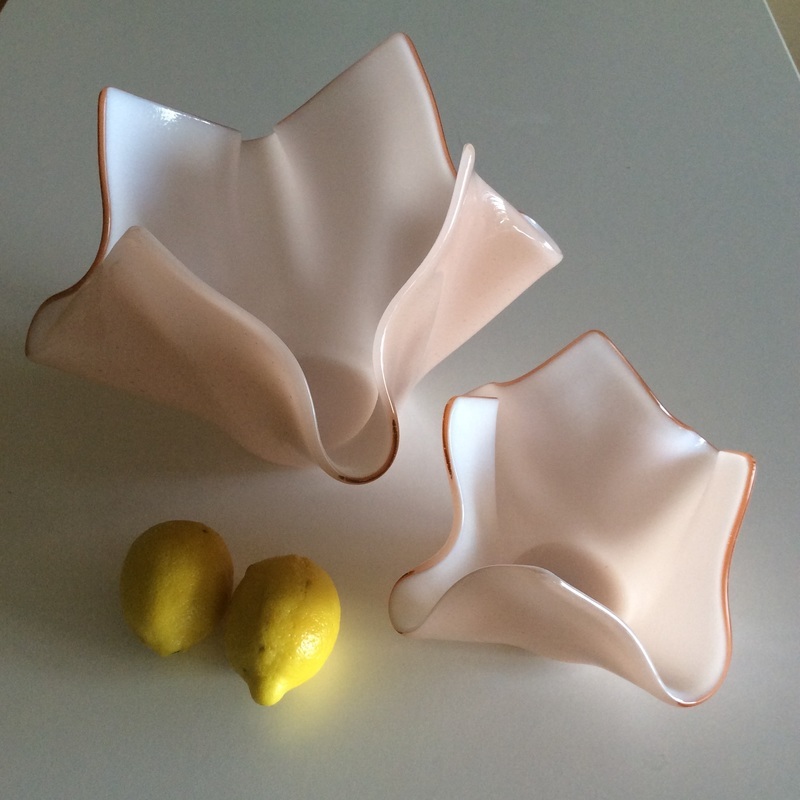 B3 "MOTHER/DAUGHTER" vessels in light coral glass . These vessels are made over a 48 hour period in my kiln and may vary slightly from one piece to the next. Light Coral on the outside - white on the inside. 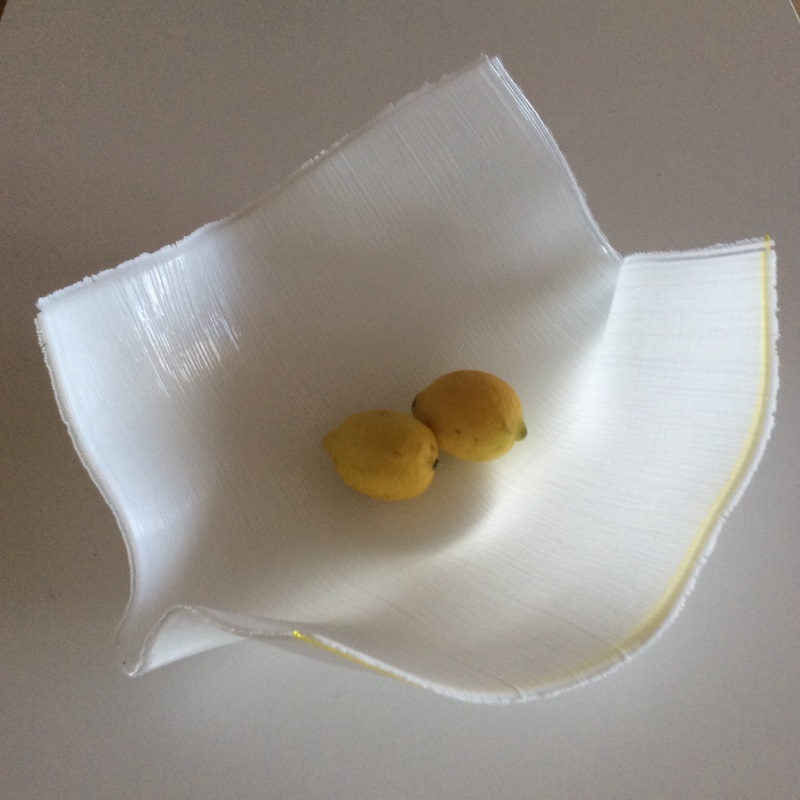 B17 "Ray of Sunshine" handkerchief bowl is made from white pieces of glass with a touch of canary yellow, fused and draped to form an elegant art piece with all four sides simulating fringes on the fabric. I make these bowls over a 48 hour period and slight variations may be expected from one piece to the next. 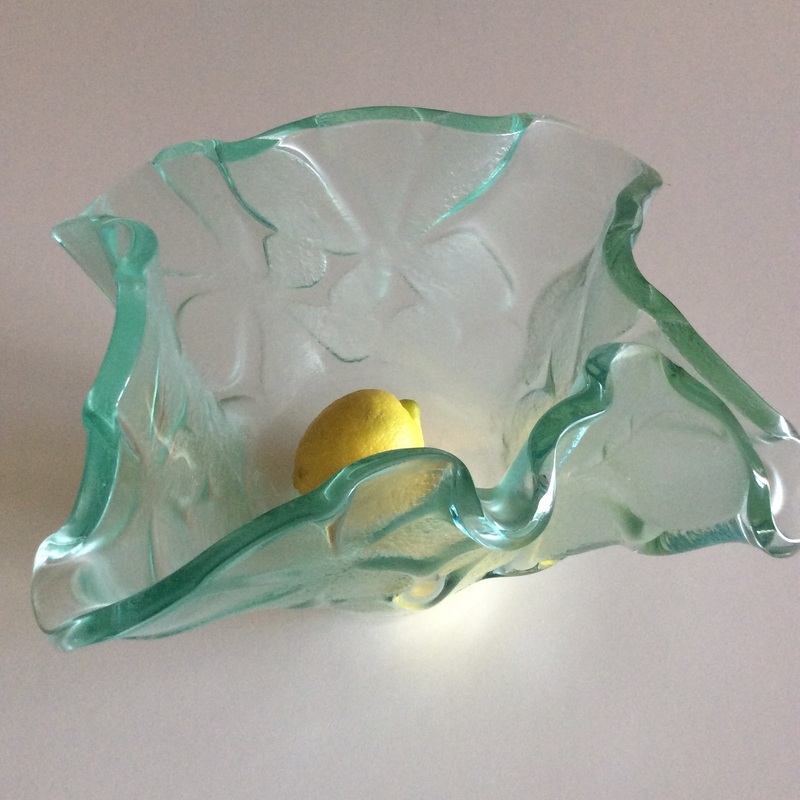 White with a touch of Canary Yellow, with "fringes"
B19 "Grid Bowl) made for indoors or outdoors (notice water cannot accumulate in bowl) of different colored glass strips. Fused and slumped into this gracious shape. 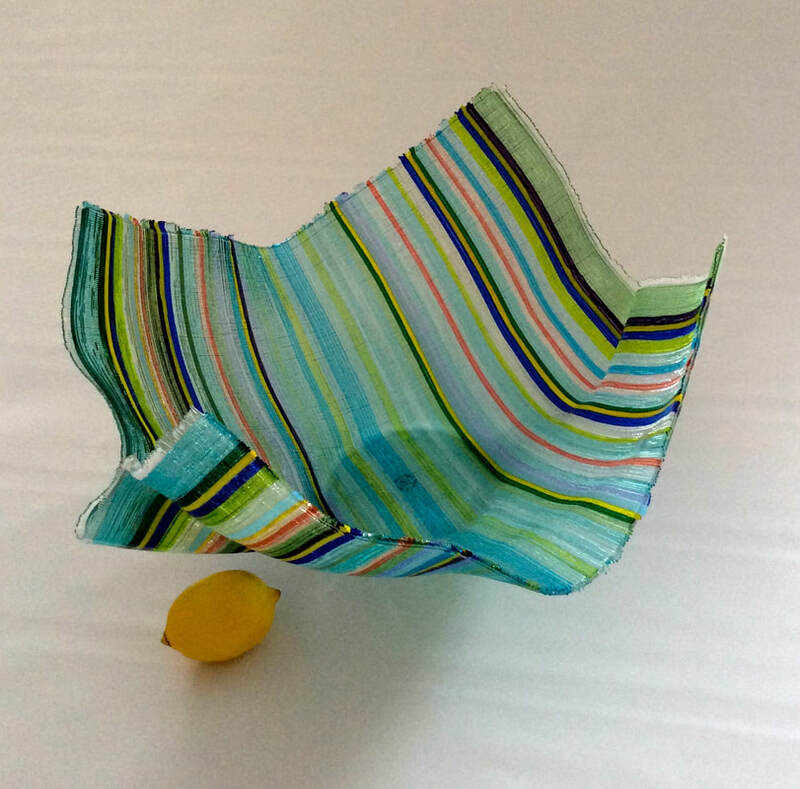 B12 Handkerchief bowl inspired by Guatemalan fabric design, this bowl is made from multicolored threads of glass, fused and draped to form an elegant art piece with all four sides simulating fringes of the fabric. I make these bowls over a 48 hour period and slight variations may be expected from one piece to the next. 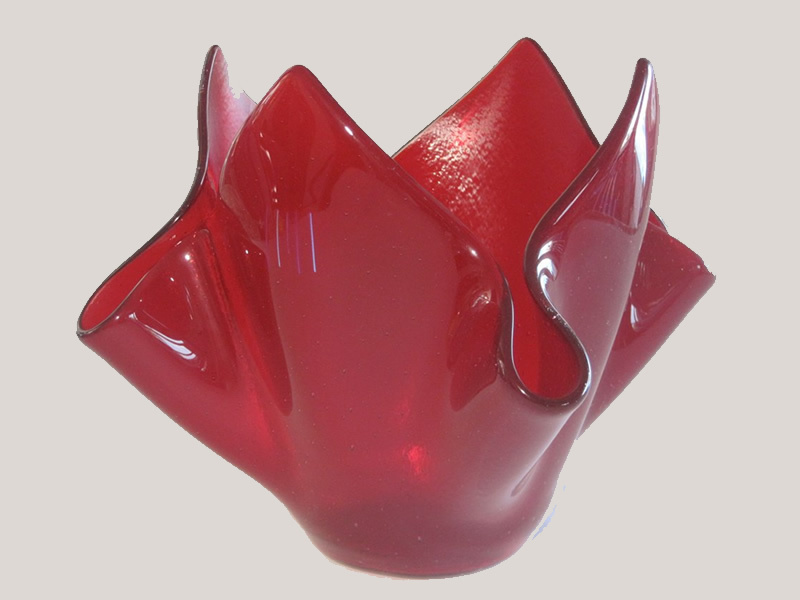 B14 "LEAVES" A stylized leaf pattern embedded into a heavy 3/8" thick clear glass vessel. Heavy glass moulded into an artistic expression which is quite functional for a multitude of uses. B16 A Light Coral Glass vessel, elegantly lined in opaque white glass. A stunning sculpture all by itself. 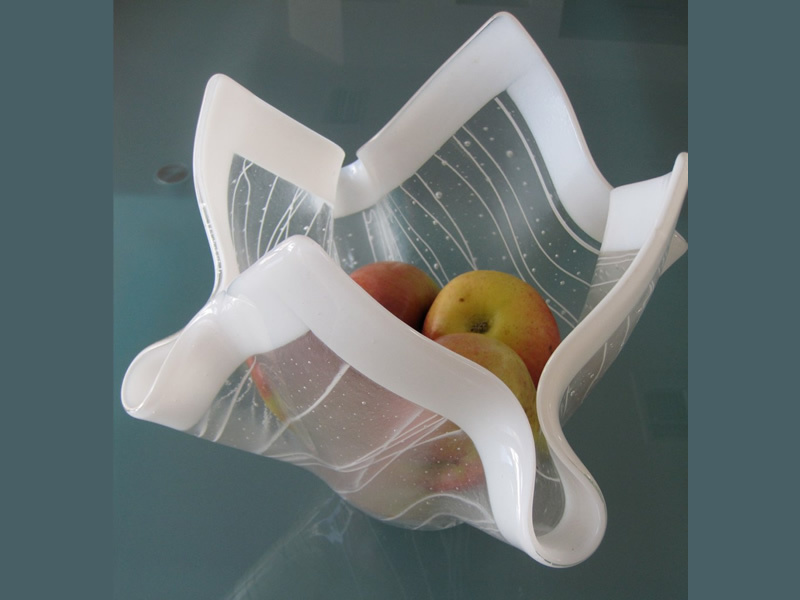 Handmade of fused glass, this vessel is fused and draped, and displays a subtle and sophisticated design. I make these vessels one at a time over a 48 hour period and slight variations may be expected from one piece to the next.